1 What Equipment Is Needed to Make Bagels? How to Make Bagels. Bagels are a traditional Jewish baked good that are very popular around the world. Bagels are eaten for breakfast with cream cheese or even with deli meats for a lunchtime sandwich. Making bagels at home is a time-intensive process, but it can be well worth it. Combine the ingredients listed in your recipe to form the bagel dough. Knead the dough for approximately five minutes, or for however long your recipe specifies. Place the kneaded bagel dough in a large, covered bowl and allow the dough to rest. Check your bagel recipe for the specific time length, but usually, the bagel dough will rest for a few hours. Remove your dough from the bowl. Shape the dough into the traditional bagel shape (a round shape with a central hole). To make this shape, you can either form a long log of bagel dough and then connect the two ends to make a circle. Alternatively, you make a ball of bagel dough and then poke a hole in the center of the ball with your finger. Place the bagels on a cookie sheet and store in the refrigerator for approximately 12 hours or overnight. Again, check your bagel recipe for the specific amount of time to let the bagels rest. Remove the bagels from the refrigerator and boil each bagel in water in a large stock pot on the stove. Sometimes, things are added to this water bath, such as honey or baking soda. Check your recipe for anything that may be added at this time. Boil the bagels for several minutes, according to your recipe. Place the boiled bagels on a cooling rack to allow them to dry. Bake your bagels on cookie sheets in your oven. 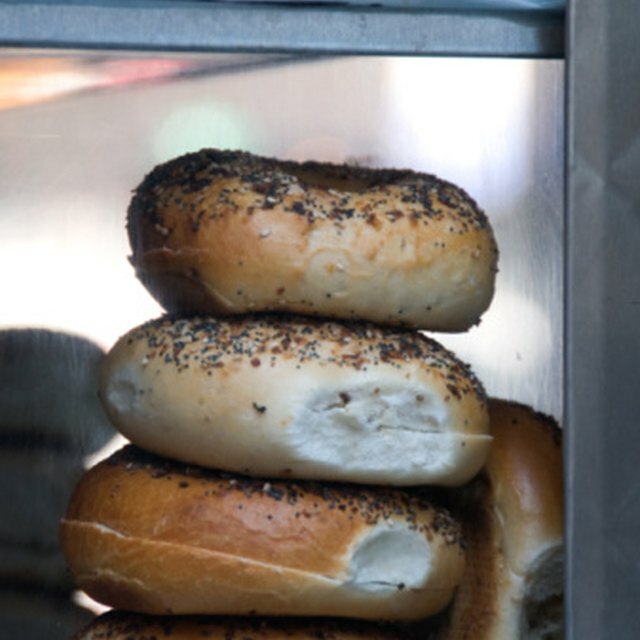 Typical bagel baking temperatures are between 350 and 450 degrees Fahrenheit. Check your recipe for the correct baking temperature and time. Boil your bagels in small batches. Do not let bagels touch each other in the water during boiling. Rotate your bagels while baking to ensure even cooking and browning. Do not cut bagels until they have cooled completely.